There are thousands of varieties of potatoes in the World and most of us will have certain favourites for certain dishes. Most of us who cook regularly, will have worked out which potatoes to use for curries, chips, etc. 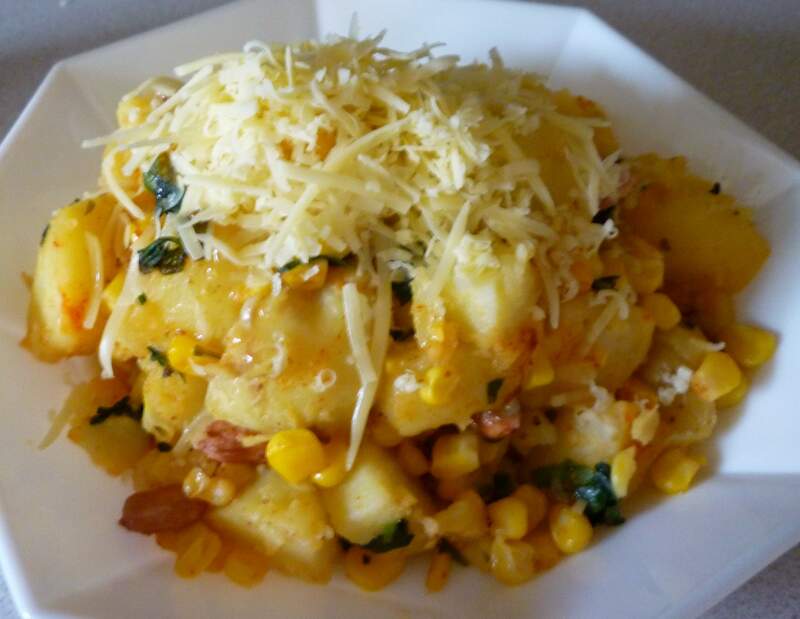 The ones I used for this recipe are the ones used mostly for making jacket potatoes – a variety called Estima. These potatoes can be baked or boiled and really make great jacket potatoes. I love having jacket potatoes as a quick snack but sometimes, I prefer to have them spicer with a hint of Indian spices. One of the ways of making the potato spicer is to sauté it with the spices. Every time, I make this I experiment with the spices and condiments. Please use this recipe as a guide but enjoy trying out different variations. 1. Wash the potato and score it in the middle with a sharp knife. 2. Boil the potatoes in a saucepan of water or wrap them in a wet kitchen paper and cook them in the microwave. I prefer to steam them in a pressure cooker. 3. 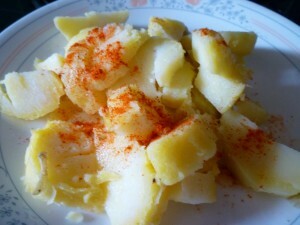 Once cooked, peel the potato, cut them into cubes, sprinkle the salt and pepper or chilli powder to the potatoes. 4. In a frying pan, heat 1 tablespoon of oil and add the cumin seeds. 5. Add the peanuts and allow them to brown slightly. 6. Now add the sweetcorn. 7. Add in the potatoes and stir well. 8. 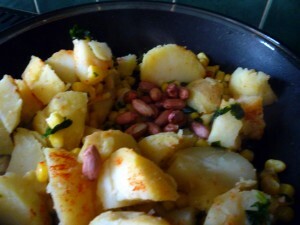 Add the sugar, lemon juice and fresh coriander (and the green chilli if you like hot food) to the potatoes. If you like honey mustard, add this just before serving the dish. 9. Allow the potatoes to sauté well. 10. If you like cheese, you can sprinkle some grated cheese on top of your potatoes when serving. Tagged Jacket potatoes, potatoes, snack, vegetarian, veggie. Bookmark the permalink. This appears to be an easy dish to cook for people who do not have time to cook. I have made this with a twist, I added Tabasco on my plate to make it even spicier!! Keep the easy recipes coming please? Very simple yet tasty dish. As ever a great simple to do but tasty menu Mina – keep ’em coming !